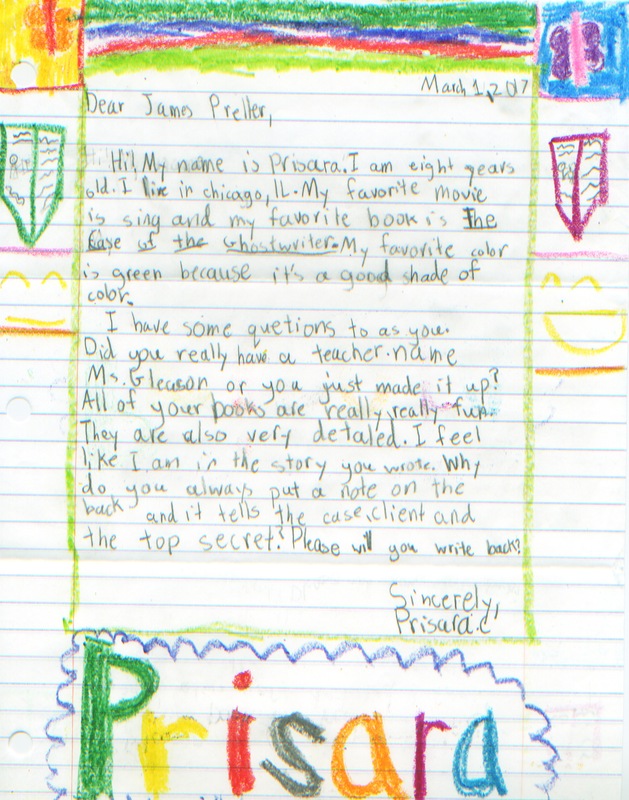 Meet Prisara from Chicago. She’s terrific and she likes the color green! And who could blame her? Dear . . . um, hmmmm. Wait, hold on. I’m trying to make out the name. Maybe if you wrote it out REALLY BIG and used RAINBOW COLORS it would have been easier for me to . . .
Prisara! What a beautiful name. I love an illustrated letter. Thank you for calling The Case of the Ghostwriter your favorite book. There’s a true part in that book. My brother Neal died long ago, and in real life I gave his name to my oldest son, Nicholas Neal Preller. So that scene with Jigsaw and his father, talking things over? That came right from my heart. For the book, I changed the name to Andrew, but the emotion is true. It’s hard to lose the people you love. Please thank your teacher for keeping my books in the classroom. All of them are impossible to get these days. Out of print. But the good news is that I just wrote a new book, The Case from Outer Space, coming out this August. In addition, eight classic titles will also be available once again. Jigsaw Jones is making a comeback! I loved your sweet letter. I’m lucky to have you as a reader. 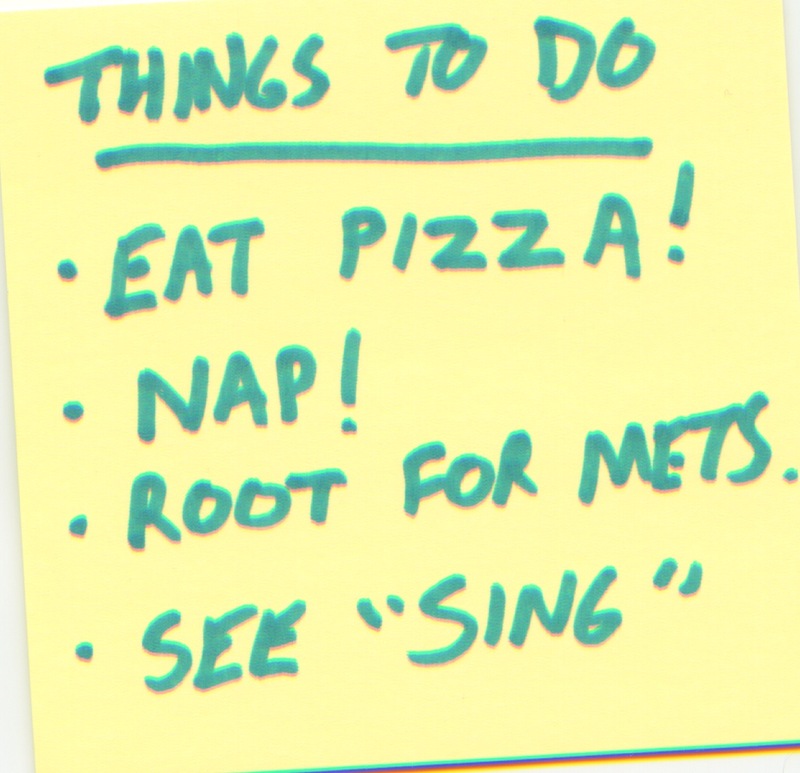 I haven’t seen your favorite movie, “Sing,” but I’ll add it to my list of things to do. Also: I totally agree about GREEN. And thanks for the self-addressed, stamped envelope. Very considerate! Illustration by Jamie Smith from Jigsaw Jones #10: The Case of the Ghostwriter. This is one of my favorite illustrations from the entire series for reasons explained below. Jamie gave me the original artwork — for free, here, take it — and now I hang it on my office wall, and it always makes me think of my brother. Every day. In what I hope will be a recurring feature on an irregular schedule, I thought I’d try to convey some of the background to each of my Jigsaw Jones titles. 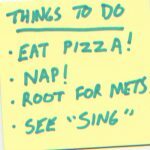 And in no particular order. The Case of the Ghostwriter has a lot of cool little things in it that most readers might miss. I dedicated this book to Frank Hodge, a near-celebrity local bookseller on Lark Street in Albany, who is known and beloved by many area teachers and librarians. He’s one of Albany’s living treasures. When I moved to the area from Brooklyn, in 1990, Frank’s store, Hodge-Podge Books, was right around the corner. Of course, I stopped in and we became friends. I actually put Frank in this story: a guy named Frank owns a store called Hedgehog Books. I even included his cat, Crisis. Jigsaw and Mila visit Frank’s store in the hopes of tracking down a mysterious author. Hedgehog Books was a cozy little store. Our parents had been taking Mila and me since we were little. My mom said that Frank’s favorite thing was to bring books and kids together. In the story, there’s a series of popular books — The Creep Show series — loosely modeled on R.L. Stine’s “Goosebumps.” Mila has been eating them up, reading titles such as Green Wet Slime and Teenage Zombie from Mars. The author’s name on the cover, a pen name, is R.V. King. (Ho-ho.) There’s a rumor that he’s coming to visit room 201 for the “Author’s Tea.” Who can the Mystery Author be? I bet you can guess. For me, the part I’m proudest of in this book is Chapter Seven, “My Middle Name,” a tribute to my oldest brother, Neal, who passed away in 1993, a few months after my first son, Nicholas, was born. Ms. Gleason has the students reading family stories in class, Abuela by Arthur Dorros and The Keeping Quilt by Patricia Pollaco. The students, including Jigsaw and Mila, are asked to write their own family stories. At bed that night, Jigsaw and his father have a heart to heart. Mr. Jones tells Jigsaw about his middle name, Andrew, who was Jigsaw’s uncle. Now this part is totally true, because my son’s middle name is Neal, after his uncle. “And he died,” I said. “Yes,” he said. “Andrew died.” I heard the air leave my father’s lips. The sound of a deep sigh. That’s when I noticed it. The water in his eyes. A single tear, then another, slid down his cheek. My father was crying. I’d never seen him cry before. It made me nervous. “Don’t be sad, Dad.” I hugged him with both arms, tight. He wiped the tears away with the back of his sleeve. He sniffed hard and smiled. Then he shut the door. I’d never attempt to read that chapter aloud to a group. 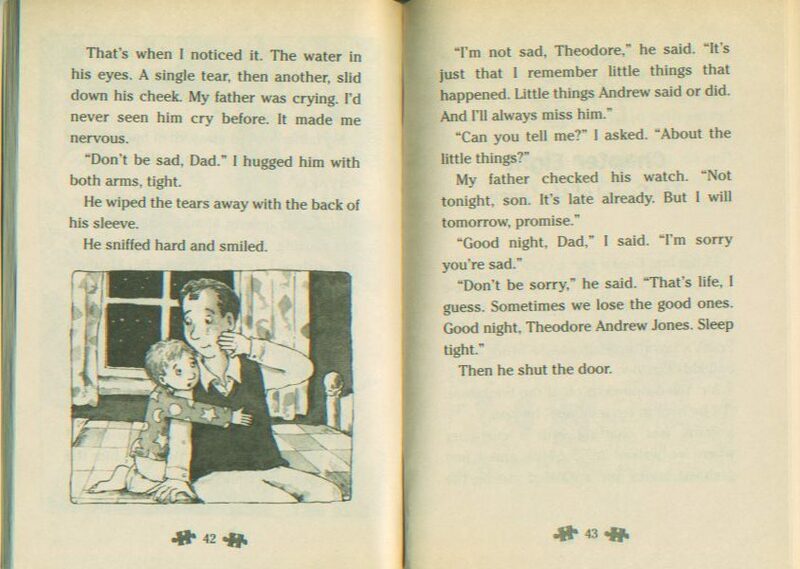 I can never read it without remembering, without crying. I guess in that scene, I’m Jigsaw’s dad — and my son, Nicholas Neal Preller, stands in for Jigsaw, trying to learn about an uncle, my brother, whom he never had the chance to meet. NOTE: I originally posted this in 2009. My local newspaper, the Albany Times-Union, ran an article today on a local legend of sorts, Frank Hodge, who has successfully operated the independent bookstore, Hodge-Podge Books, for the past 27 years. ALBANY — By now you’ve heard the story, because there’s no shortage of funereal tales about the closing of a yet another independent book, video or record store. You don’t need a newspaper to tell you that losing such enterprises is a blow to a city’s cultural life, another step toward a blander and more homogenized future. That’s pretty obvious. So for this story about the June 30 closing of Hodge-Podge Books, let’s focus on the positive. Let’s avoid the hand wringing and consider instead the accomplishments of its 78-year-old owner. First off, Frank Hodge opened the children’s bookstore in 1982 and kept it open for 27 years, making it an institution, of sorts, and one of the oldest of Lark Street stores. During its tenure, Hodge-Podge gained national esteem. For the complete text, begin insanely clicking right now. Faithful readers of this blog — and aren’t you all? 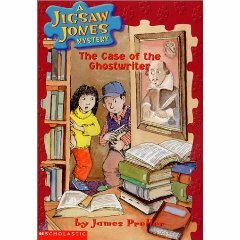 — may recall that I previously wrote about Frank here, explaining how I put him in a Jigsaw Jones mystery, The Case of the Ghostwriter. In fact, even his cat, Crisis, played a minor (but cuddly) role. Book people, from editors to librarians to readers, quite possibly know of Frank without any help from me. 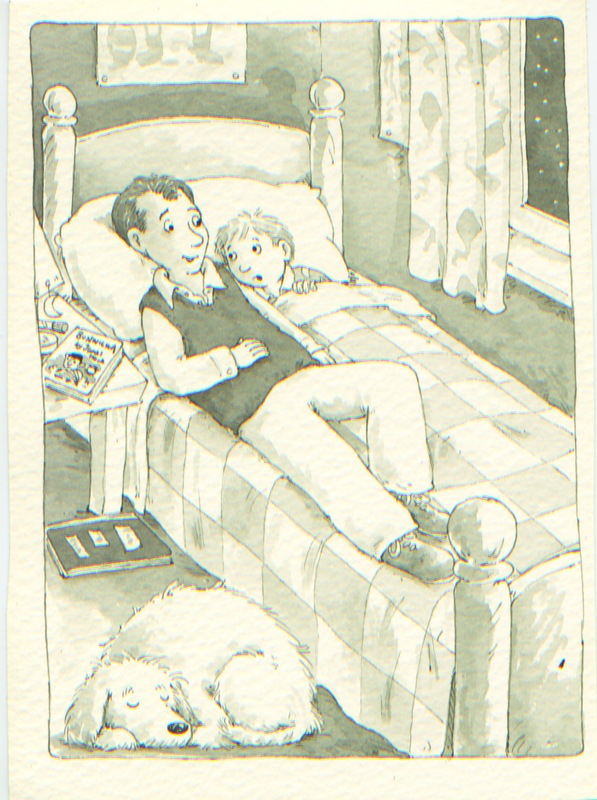 He remains a singular character in our shared community of children’s books. The article concludes by stating that Frank is threatening to blog at this site. At this point, I think Frank is lining up his ducks, closing the store, sweeping out the closets. He hopes to be blogging by the end of July. So let me be among the first to roll out the red carpet. In the meantime, Frank’s little store (I keep hearing Paul Simon’s, “My Little Town”) will be open through June, and I hope to swing by. To me, he’s like that long-lost relative you never see often enough. Time passes and you think, I really ought to visit Frank. Well, now I really ought to. Last comment: I mentioned to my son, Gavin, almost 10, that Hodge-Podge was closing. “Oh, no, I love that place!” he lamented. “Really? You haven’t been there that often,” I said. “He gave me the first Wimpy Kid book — for free!” Gavin explained. And that’s typical Frank. He knew how to make friends for life. The trick? Shove a good book in their hands.